The ZT brand has one mission: to design premium-quality, heavy-duty knives. 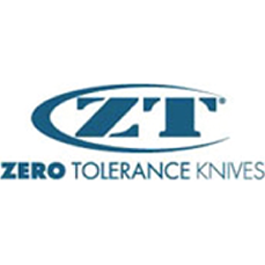 Zero Tolerance first made its appearance in 2006 as the go-to brand for American made knives that meet the needs of professionals, such as the military, law enforcement, firefighters and others. Their initial products were combat knives, but since then, the line has expanded to include a variety of general-use and premium knives. These American made knives are built of premium materials such as S30V, ELMAX, or 154CM blade steel and 3-D machined G-10 handle scales. Zero Tolerance knives have earned a reputation of being "proudly—overbuilt". These knives are developed to be durable and dependable. Despite the larger and heavier knives, many customers use ZT products as everyday carrying knives.